Friday Facts- March 21, 2014- Who Shot J.R? Who remembers this? The Who Shot J.R. Episode? My mom watched Dallas every week when it was on the air in the late 1970s and early 80s. I didn’t watch it but I do remember the frenzy that the episode called A House Divided caused. That episode ran on March 21, 1980 and the whole summer, people were talking about who they thought did it and if J.R. was actually dead. It really was a brilliant cliffhanger and marketing ploy. Our local tv station ran a contest for people to write in their take on who would have done it. Now, mind you, I didn’t watch the show but I wanted in on that fun so one day I sat down with my mom and she went over who the characters were on the show and how they were related to J.R. It was a fun summer of t-shirts asking the question of who shot J.R. as well as betting parlors taking wagers and lots of contests all over the USA asking the vital question. Larry Hagman was even offered a bribe but he didn’t know either. The catchphrase was used in the political campaigns that summer and the Queen Mother in England even wanted Hagman to tell her the answer. The episode still stands at the number two highest rated television episode right behind the finale of M*A*S*H and it started a trend that lasts to this day for cliff-hanger episodes at the end of the season for a show. Brilliant! Don’t we as authors wish we could find that particular brand of magic that enthralled the English speaking world that summer of 1980? Oh Yeah, I think Fifty Shades might have found it. 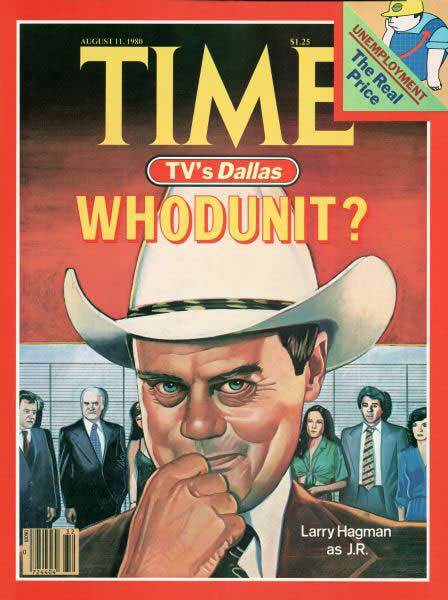 I didn’t watch Dallas either but I do remember that episode and summer of speculation. I think you’re right about that, Lavada re: Fifty Shades. A local car dealership outside of Washington,DC ran a contest and I won a weekend at the “new” Harrah’s in Atlantic City for guessing Who Shot J.R. .It was just being built up and the casinos had only been there for a couple of years. I never took advantage of it.If I can find the letter,I wonder if they’d honor it? Dang, you should have gone. That was excellent marketing. I watched Dallas. And Knot’s Landing. Avidly. And you want to know what’s really funny? I always said I never watched soaps. Pu-lease! The only difference between these shows and the daytime soaps was the hour they aired. Lol. Fun times. Lol. I agree Laurie. They were def. soaps. I DID watch Knots Landing. I loved it. I used to watch Dallas, but I can’t remember who did it! I do wish I was the innovator of something like the cliffhanger. I’d like everybody to copy something I did. We need to work on that project, don’t we Shay? Be trendsetters!